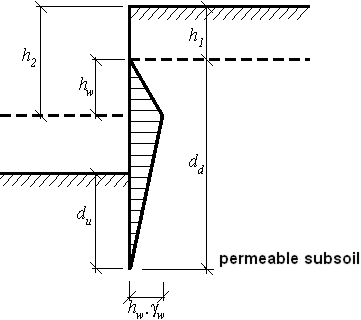 The heel of a structure is sunk into permeable subsoil, which allows free water flow below the structure - see figure. The unit weight of soil lifted by uplift pressure γsu is modified to account for flow pressure. These modifications then depend on the direction of water flow. Is greater than the unit weight of saturated soil γsu, then the leaching appears in front of structure - as a consequence of water flow the soil behaves as weightless and thus cannot transmit any load. The program then prompts a warning message and further assumes the value of γ = 0. The result therefore no longer corresponds to the original input - is safer.